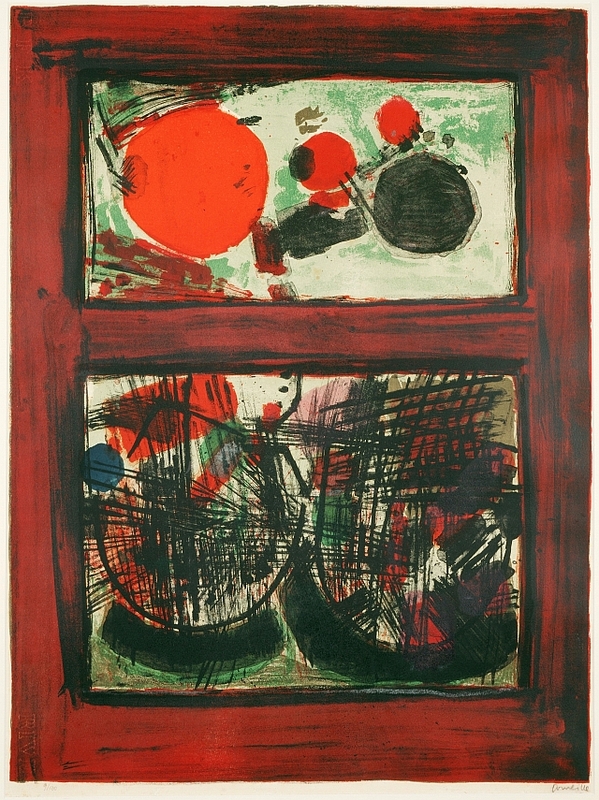 In the Van Diepen collection is a sparkling colour litho of the famous artist Corneille. Corneille Guillaume Beverloo was born in Liège, Belgium, from Dutch parents. From an early age he signed with his first name. I thought it was too pretentious to put my last name under what I had made. He lived and worked in Liège until 1939, in Haarlem until 1940, and then followed lessons at the Rijksacademie in Amsterdam together with Karel Appel. A trip to Budapest in 1947 had a lasting impact on his work. He got to know the writings and work of Paul Klee and Joan Miró. He then travelled to many countries, including Africa and America. In these travels he sought the contrast between culture and nature, the tension between civilization and the primitive. From 1950 he lived and worked in Paris. In 1948, Corneille was co-founder of the international COBRA group, named after the three local names from which the group members came: Copenhagen, Brussels and Amsterdam. An important concept for this group was the experiment, either individually or jointly. Equally important was internationalism, the contacts between artists from many countries. The Cobra artists were champions of a free, spontaneous and natural art. They worked in a way that, according to the general public, looked childish and unskilled. That’s possible my son could also “was a phrase that was often used to characterize the work of Cobral members. Corneille had many foreign contacts, but also the work of Dutch painters like Karel Appel and Constant attracted him. He was also very interested in the work of poets such as Elburg, Lucebert, Kouwenaar and Achterberg. In his graphic oeuvre he collaborated with Simon Vinkenoog and Hugo Claus. Corneille practiced many techniques. He painted, watercoloured, drew, etched, lithographed and made wood and copper engravings. He used dynamic colours, and simple depictions with, for example, women, birds, trees and leaves. In his last years he had a studio in Paris. He lived in Auvers-sur-Oise, where he died on 5 September 2010. Corneille was buried there in the same cemetery as before Vincent van Gogh. 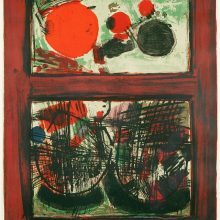 The colour litho of Corneille in Van Diepen collection is not dated, but was purchased in 1961 and therefore from before that year. The representation is abstract, in which spheres and planes are scattered in two rectangular frames. The main colours are red, green, old pink and black.